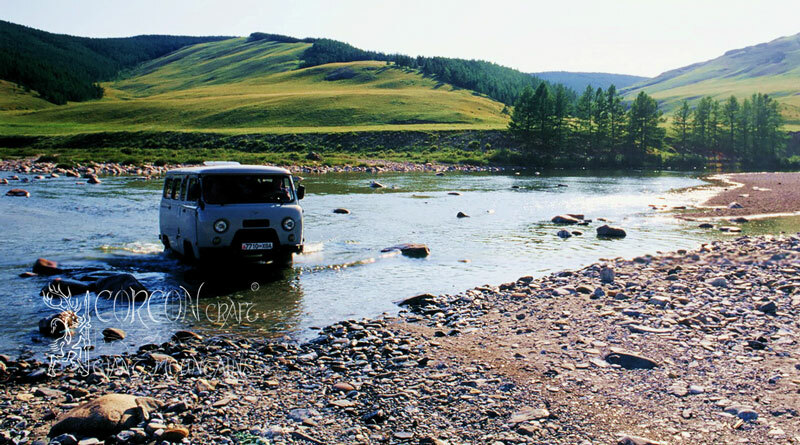 Situated in the vast highlands of the Mongolian / Siberian Borders at a truly magical place, where the renowned Taimen Rivers Shishkid and Tengis flow together. 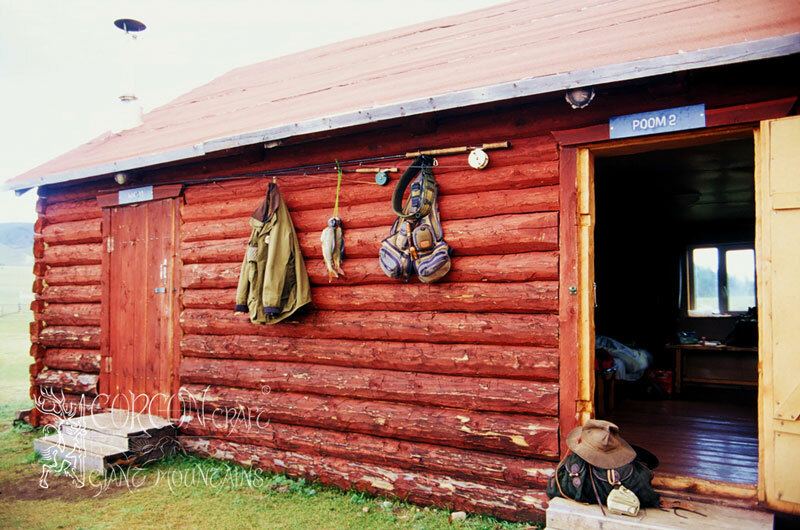 On these banks one of our first and most productive fishing lodges is to be found, established deep in the National Park of Khovsgol in the Darhat Basin of the northern province. 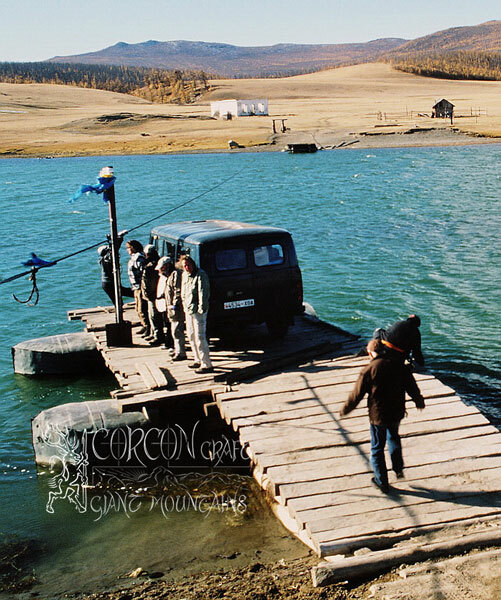 Located 350 km from the nearest provincial town Moron and about 1200 km (800 miles) from Ulaan Baatar. To be reached by helicopter or by off road 4-wheel drives only. A scenic highland grandeur in the Eastern Sajan Mountains with peaks of 3500 m (11000 ft) tall mountains surrounding the camp. Plenty of highland impressions, country folklore and ethnic motives for the demanding wildlife photographer and naturalist off the beaten tracks. The crossings of many a wild river throughout the entire trail and a truly breathtaking landscape during a full days ride await the adventurous sportsman on the way to our wilderness camp Tengis. Named after the river Tengis, flowing from the wild mountains in the north, and after a fierce clan of warriors, which had their traditional stronghold here at this spiritual place for many centuries, is our base camp and fishing lodge "Tengis". Some of the foremost family members of this old clan are still going strong in the region and we are proud to work with them closely throughout our fishing and wilderness tours and to have these fine people as essential members of our guiding service for clients and guests at Fishing Camp Tengis. Local nomadic herders are living nearby our camp with their half-wild steppe horses, robust yak cattle and enduring camels, and are frequent guests at the lodge, sometimes trading and offering some of their traditional crafts and products to our European sportsmen. 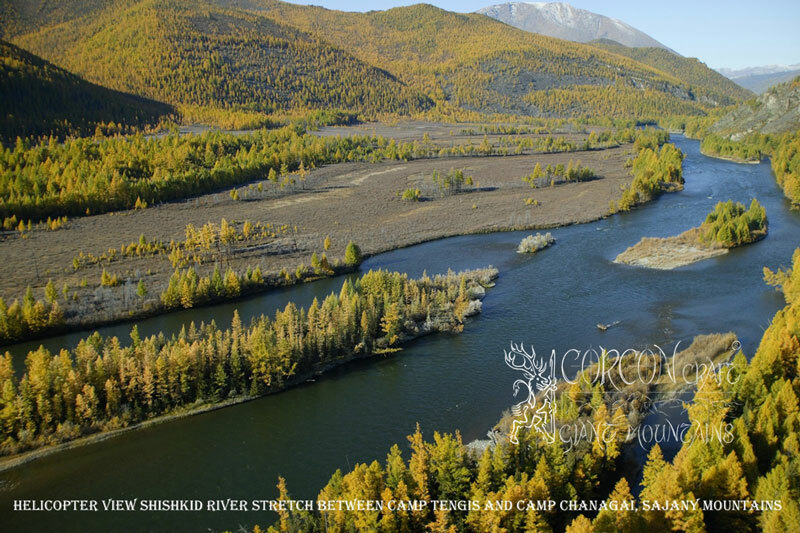 Both rivers Shishkid and Tengis are leased by us directly from the Mongolian Government for a period of 50 years. 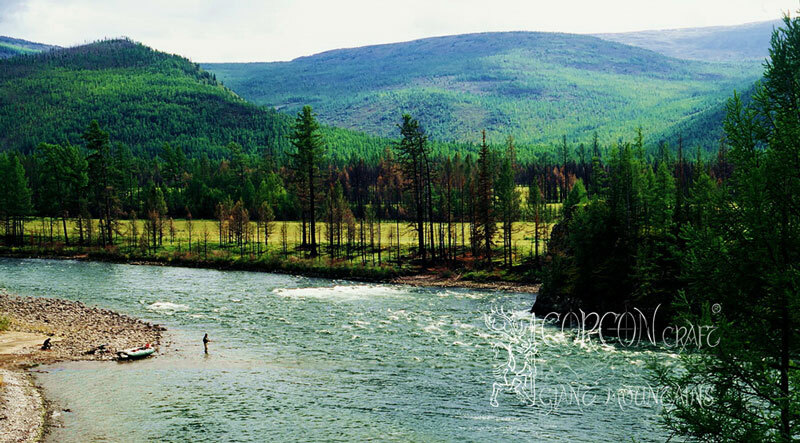 Together these two great Taimen Rivers mark a stretch of close to 150 km exclusive wilderness fishing for our sportsmen only. 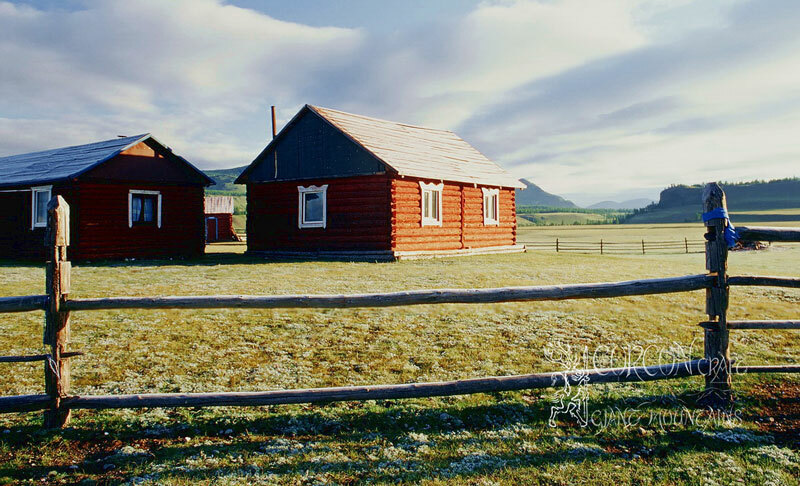 Two solid and well equipped lodges "Tengis" and "Chanagai" are built in a traditional way, 25 km apart at strategic spots, and are maintained by us for 20 years now, with good horse-trails and hunting cabins established along the rivers for comfortable over-night camping and fishing at remote Taimen pools. Nearby are the Taimen Rivers Shargin and Sharyk too, in easy reach by our jeeps and vans for additional fishing and camping during some shorter tours and explorations. Also river float trips with our own rafts are undertaken regularly from the main lodges, for extra days of highland impressions and fishing adventures for our clients. 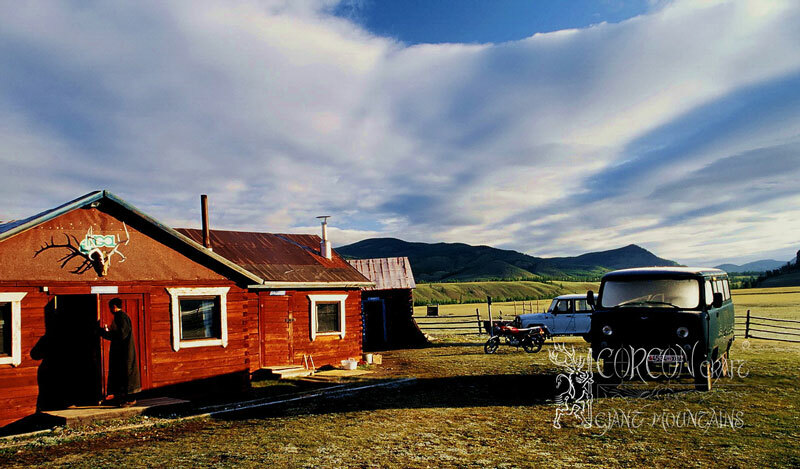 Besides fresh beef and lamb from the local nomadic herders, deer venison from the woods, and daily abundant grayling and trout from the streams, also shepherds cheese, herby goats cheese, Mongolian dark bread, local vegetables, milk-dairy, wild berries and home-made bakery are served. True organic and natural food in the best sense of the word, which reveals unmatched rich taste and full grain. But also European dishes and genuine Czech cuisine (close related with Bavarian and Austrian gastronomy) are offered, and we always hold a sustainable stock of best original Czech beer and premium French wine for our guests, who are pleased to enjoy relaxed evenings in good company and the sun-downs of unforgettable days of Taimen fishing. 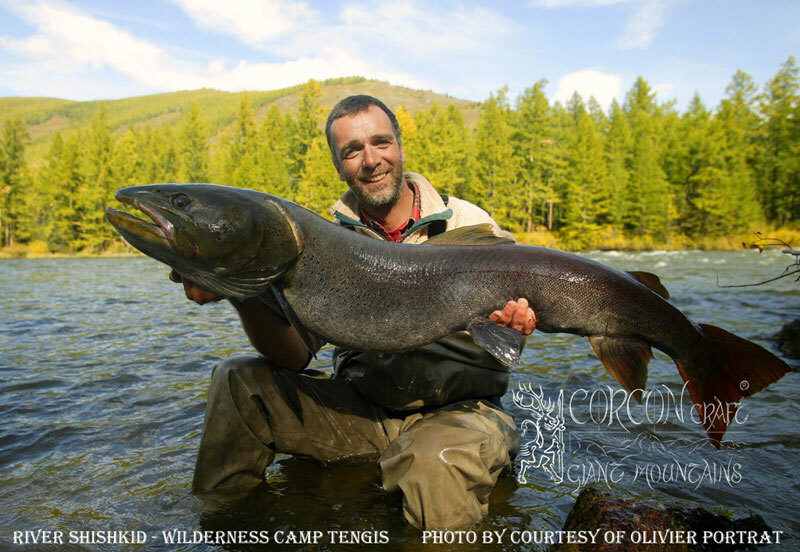 All of the great Taimen caught by our sportsmen clients are released and returned into the river. Therefore, we strongly recommend the use of barbless single-hooks. An angler may appreciate the holding power of a double-hook on his fly or lure, but he should keep in mind the damage it does to such a heavy and hard fighting fish. We can not tolerate any treble-hooks. 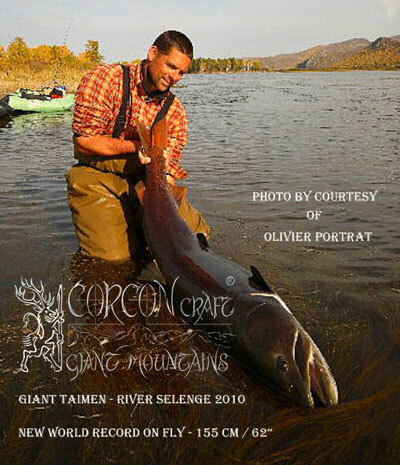 Trophy-pictures are taken generally with the sportsman standing in the river with his record Taimen. While the fish needs to recover in the stream before being released, there is usually plenty of time for a whole series of well-made photos, if treated in such a caring way as instructed by our local fishing guide. Our sportsmen-clients must bear in mind, that the Taimen is a holy fish for the local tribesmen and their age-old mythology and shamanism. These sacred fish are known of being spiritually close connected with humans and therefore shall never be killed, nor hurt, nor taken out of the river. Our caught Taimen shall be treated with the respect they deserve, being the master of the river. Fantastic pictures will be the reward for the sportsman, and his memories, to take back home as his true trophy and his achievement of a life-time adventure. The hunting grounds of such a large predator as the Taimen-Huchen are naturally limited even in his wild habitat, as every seasoned fisherman knows by his own experience. As the great Taimen is a stationary fish much in the way of a cunning old brown trout, there is a natural limit in the quantity of adult top predator fish in any wild river. While the Shishkid is a stream of unusual variety and wild beauty, with plentiful rocks, bends, rapids, crooks, boulders and deep pools with abundant food-fish, there is an extraordinary rich habitat for big predators and therefore holds more full-grown Taimen per mile, than probably any other river. 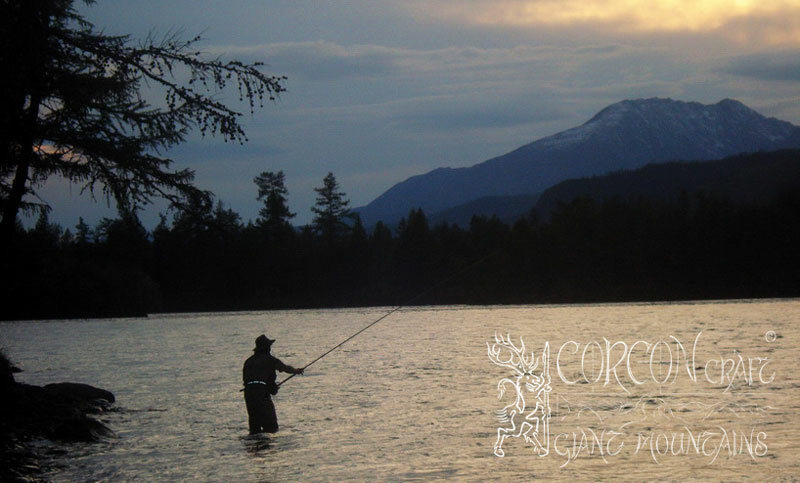 Obviously we know the traditional lays of the largest specimen within the reach of our lodges perfectly well, with still plenty of never fished and vastly extensive river stretches of pure, virgin wilderness at the doorstep of our camps. Over the years, some educated old Taimen at our lodge pools are more likely to accept smaller fly-patterns like classic wets and nymphs, offering truly tremendous sport on lighter tackle. 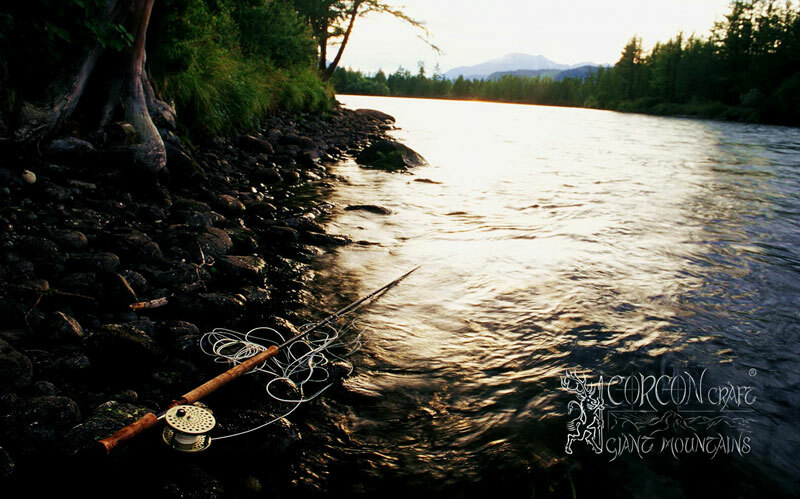 While the untouched wilderness fish will still take the largest fly or lure You are able to cast ! Even though big fish angling is never easy and it takes a great deal of commitment and endurance by any sportsman, but due to the strictly limited rods per lodge, there are good records of catches every single day on our rivers, and there is always a fair chance for a true trophy-class Taimen during a 14-day fishing vacation, if the client is prepared to work for it. 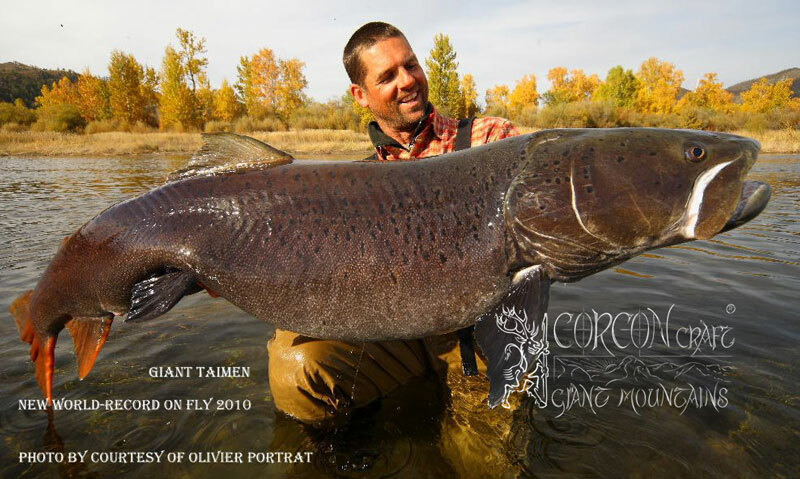 Record-class Taimen of 60"plus inches are taken every season, photographed and carefully returned into the river. While a 55"inch fish can be considered a fine trophy at our rivers. Large yellow-tail grayling and massive Lenok trout are caught plentiful every single day. 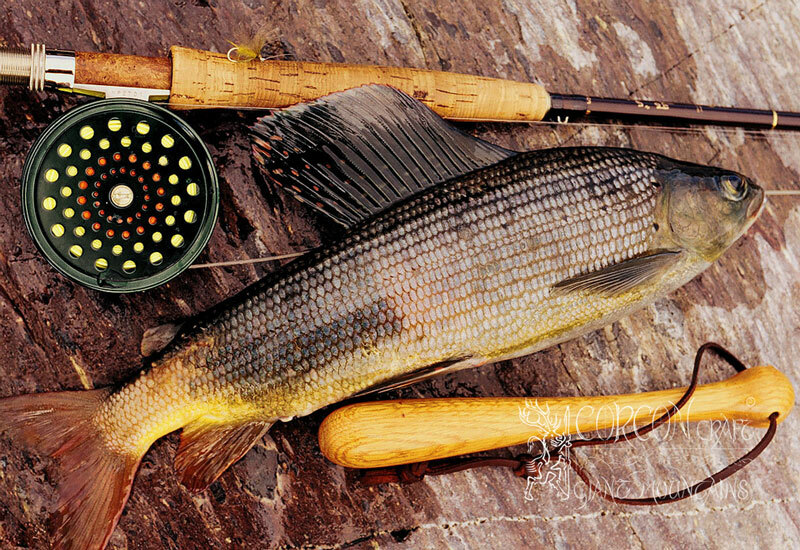 The beautiful grayling being the "bread and butter" fish of the stream, is so abundant, that he seems to feed Taimen, otters, bears, cormorants and fishermen alike, without any noticeable decline. Their common size is 45-50 cm (18-20"), while much larger specimen are caught frequently. 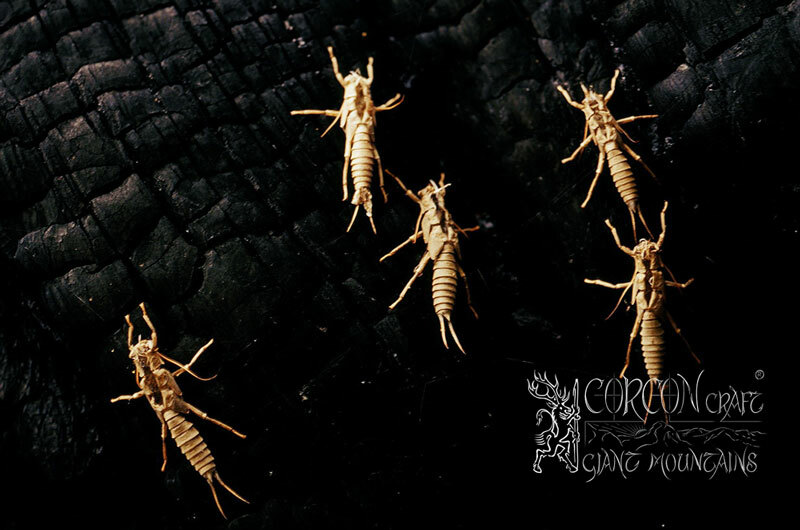 Seasoned fly-fishermen exceed a daily score of 50 grayling easily, until their arms ache and they begin to concentrate on the large game fish in the river. The Siberian Lenok trout is hooked plentiful every day, while fishing for Taimen with large flies and lures, but can be targeted selectively by the use of dry flies and special Czech nymph patterns. A Lenok trout of a mere 55 cm will be the rare exception, even though still a very pretty fish with stunning colors and proportions, but the general common size of trout in our rivers is 65-70 cm (26-28"), with record-class fish up to 36" caught every season. Lenok and grayling are treated in a respectful way and released too, but can represent a welcomed addition to the daily menu and a limited number is taken for the kitchen in camp. Also an exceptional trophy specimen can be kept for the taxidermist and taken back home. First of all, the newcomer to our Mongolian rivers should forget about his favorite 4 or 5-weight rod for brook trout and leave it at home. Just as a seasoned game-shot does not go out big game hunting with a swift .270 magnum, but relies on a heavier large-bore with plenty of power. 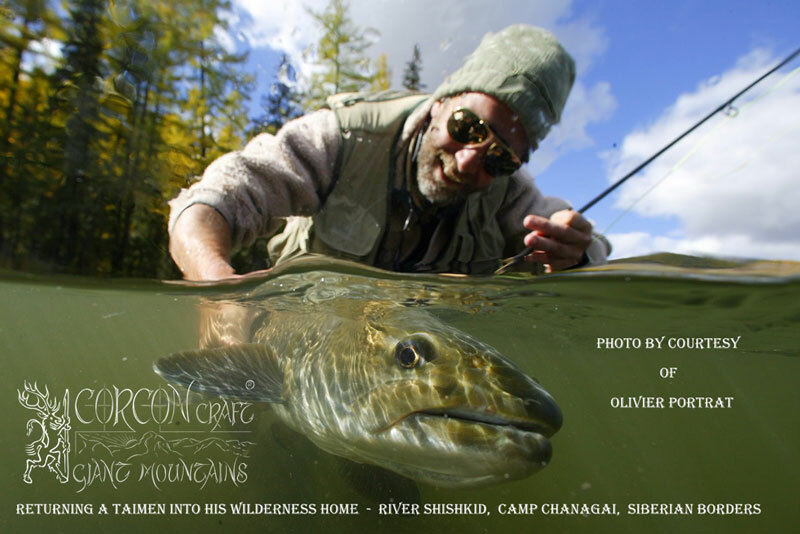 The most versatile all-round fly rod for grayling and trout in Mongolia is a 10'ft. # 7-weight with a more classic middle to tip action and some strong backbone for fishing with wet flies and weighted nymphs. While a long and solid # 6-weight is the absolute bottom line of equipment for fishing with dry flies and top water techniques on the big Mongolian rivers. A good # 7 rod will be capable of holding even a juvenile Taimen up to 36-40", taking the larger flies while fishing for Lenok. A long 11'ft # 7/8 single-hander is an excellent work-horse for the big rivers and lakes and for roll-casting, if an angler has the stout arms necessary to use such a rod over several days of serious fishing, without hurting his wrist and shoulder. Otherwise a 10'ft rod or a light 12'ft double-hander is probably the better option for Lenok fishing in Mongolia. For fishing Taimen seriously, no lighter rod than a # 9/10 weight should be taken into consideration, while a crisp and powerful # 11/12 weight rod with long extension handle and fighting grip is the real weapon of the day. However, on these large rivers, where wading is asked for and very big, weighted flies are used, a strong double-hander is a far better fishing tool. 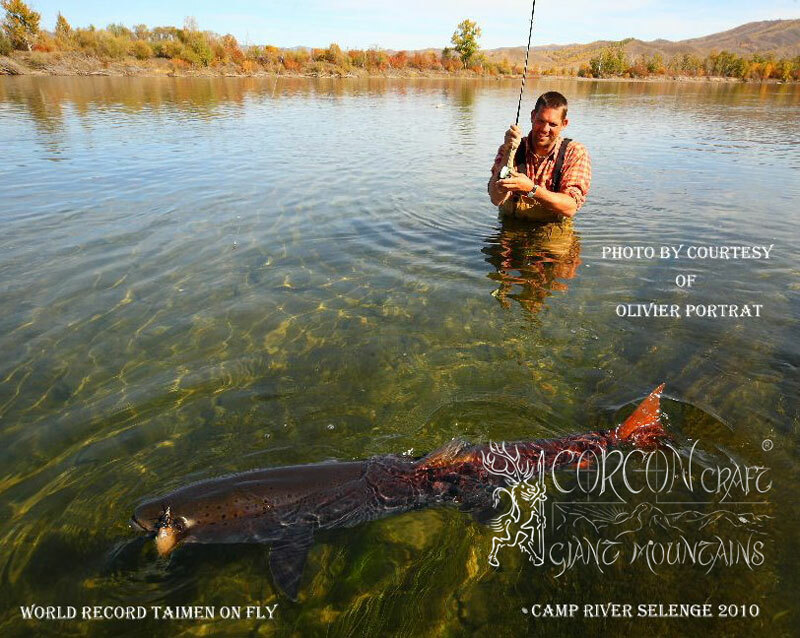 A mighty English 15' or 16' footer as used for Atlantic Salmon is a very good choice, while a shorter American double-hander, as being developed for casting sinking lines and weighted flies on the West Coast for Steelhead and Pacific Salmon, is probably the very best choice for Taimen fishing in Mongolia today. The fully caged reel should take sufficient 50 lbs. 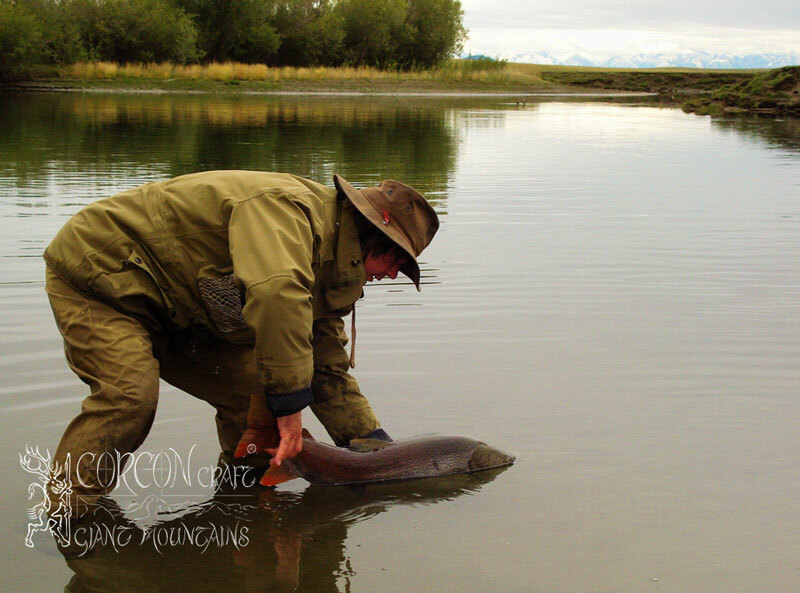 backing of 200 yards and feature a robust disc-drag to hold and control the fish. 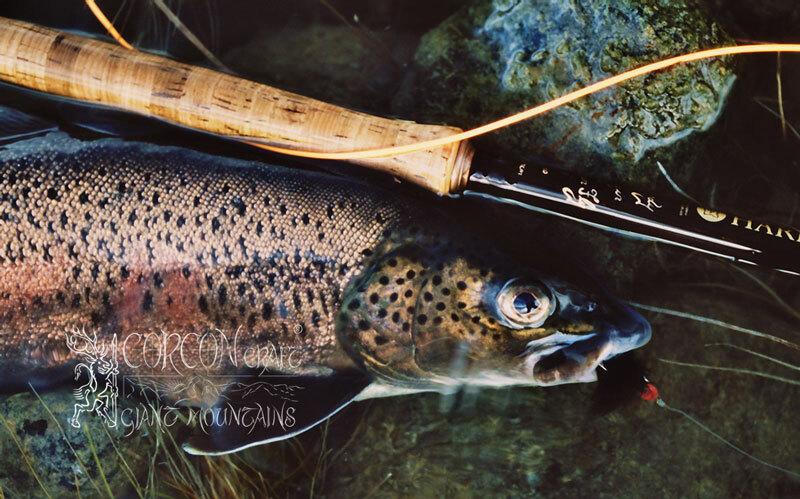 Classic fly-fishing equipment with parabolic action and click-check drag is great sport for Lenok trout. However, these fine fishing tools were developed to wear out and kill the fish back in the good old days of plentiful salmon fishing. For Taimen fishing today, where we release all of the precious fish, more modern reels with a powerful drag-system should be considered, in order to tame and land the hooked fish with command and not to wear out the heavy-bodied and hard fighting Taimen completely. 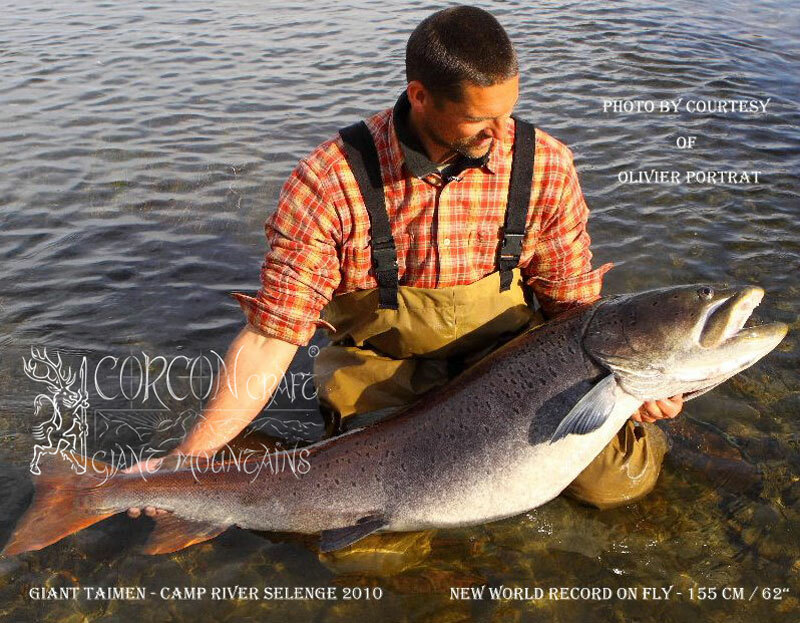 The adventurous sportsman must always bear in mind, that his target is one of the grandest game fish in the world, who exceeds 5 foot in length and 80 pounds in weight at our rivers ! Forged single hooks should be used only, featuring a large wide open arch, to hold the big fish securely. Traditional old English Salmon hooks are fine too, as long as they are forged and strong enough to penetrate and firmly hold in the hard mouth of a mature Taimen, without braking or opening. A sharp, barbless spear-head point is the best choice, to set the hook with authority by the use of the strongest tippets and leaders available. 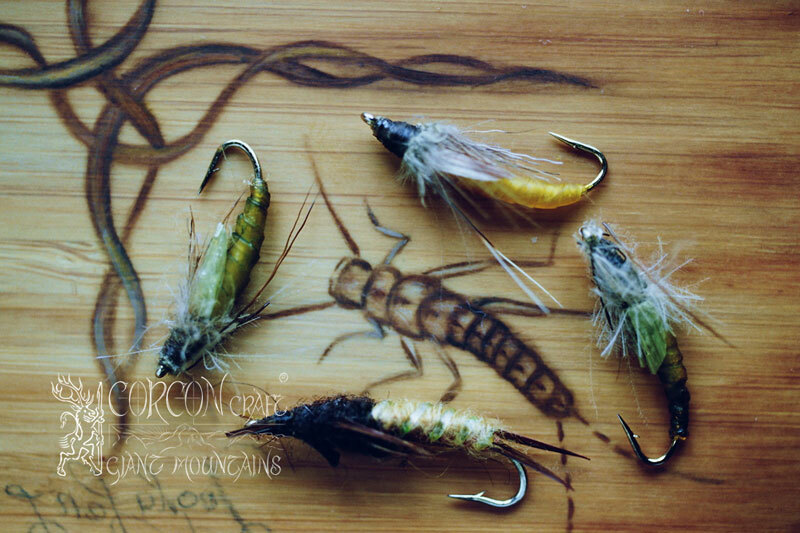 The special fly-patterns will be advised by our local guide and fly-tyier. 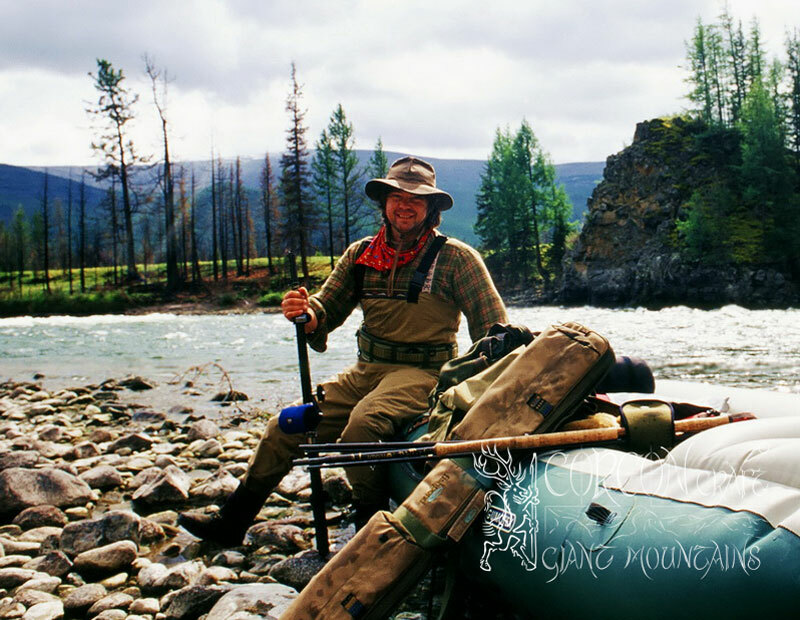 A good wading-staff is simply common sense on our wild rivers, while robust wading boots with a new felt-sole, a firm wading belt and an inflatable life-vest are mandatory for fishing with us in the strong currents of Mongolia's mighty rivers. Your local guide and professional hunter is armed with a large-bore double rifle, to keep the great Siberian Brown Bear at bay. Fluent in English, German, Spanish and Russian, he is responsible for Your personal safety at all times and at Your service during the entire trip. Prime season for fly-fishing Taimen in Mongolia is the second half of June till mid of July, just after the fish have been spawning in May and are hungry and actively feeding. The extensive hatchings of large insects at the opening of the season can be sensational. 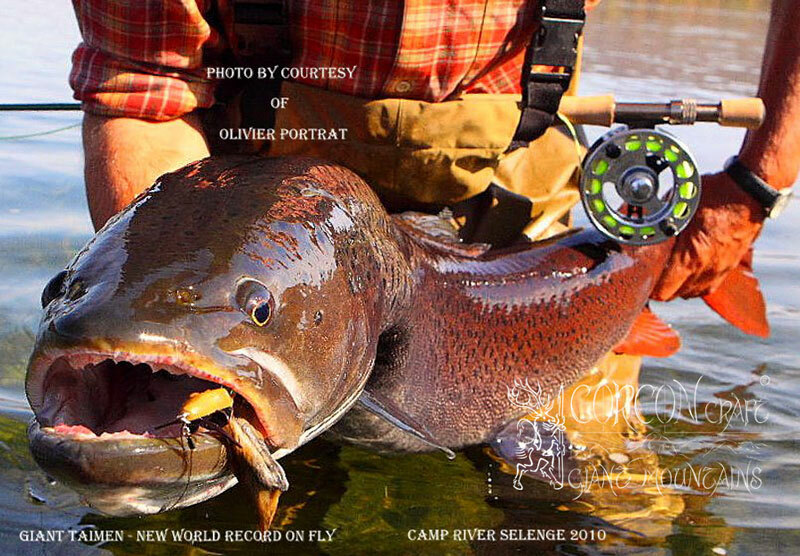 Late August through September is very good again for the fly-fisher, while in October colorful streamers and lures are more effective, just before the end of the feeding period of this large predator, also called the "River Wolf" in wild Mongolia. Periods of rest for Taimen-Huchen and poor acceptance of food and lures are during the heat of mid-summer and the long winter with frozen rivers. Even though this ancient trout giant is a non-migratory fish in general, he can move quite a distance to his spawning grounds or to find his favorite food-sources in certain river systems. The close-by Shargyn river for example, situated on wide-open sandy ground in the Darhat Basin, can be great sport with very big Taimen at a certain time of the season and when the water level is right, while the same river can be completely empty and without any lesser food-fish to be found for the great predator. 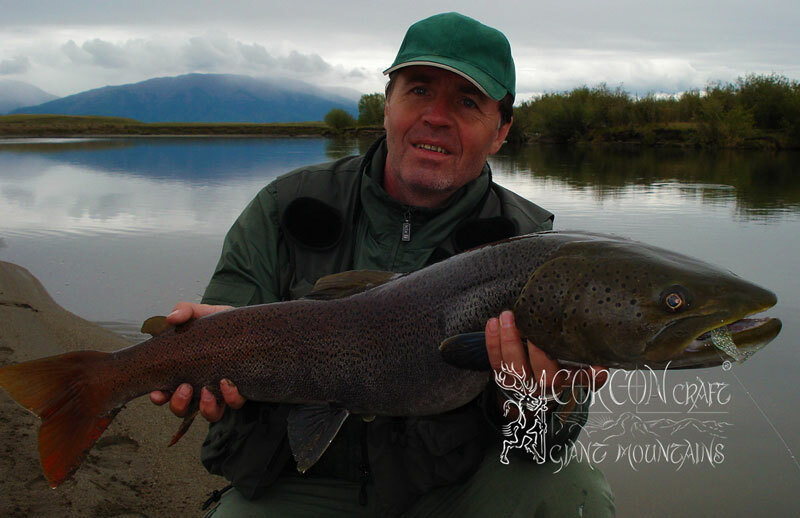 While Taimen fishing is not a gamble like fishing for salmon, as these are land-locked fish and can not leave the river in general, still our guides have to know the waters and conditions very well, to find the feeding Taimen throughout the changing seasons. On the other hand, at some rivers with open public access and considerable pressure at certain times of the year, the fishing can be a gamble just as salmon fishing. Due to our long-term fishing rights and our pronounced conservation activities in the region, those limited sportsmen fishing with us, can enjoy more and larger Taimen catches every season, on the contrary to many other Taimen rivers with easy public access. 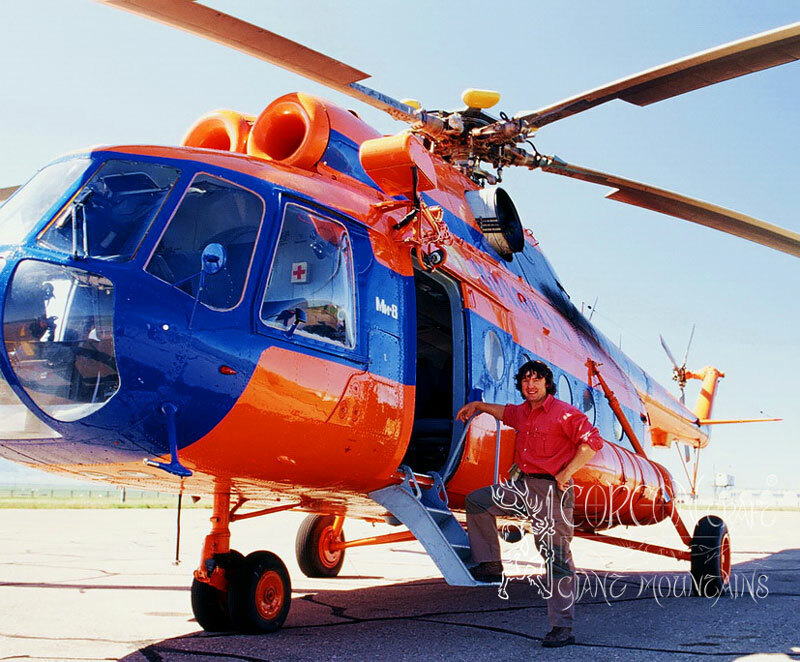 Being a Czech, German and Mongolian based company with traditionally old business contacts in Mongolia, we have been the first in the country, after the break-apart of the former Sovjet Union, to go fishing ourselves and to operate professional tours for our friends and clients back home. Russian is a common language for us and we have been running our own office in Ulaan Baatar long before National Geographic and other American and English explorers and operators have arrived. We do not have "agreements" on certain public river systems, but pay good money for exclusive fishing rights and limited Taimen licenses from the government. Therefore we are proud to run fixed log-cabin lodges at our own extensive, protected river stretches, and there is no obvious need for moving tent-camps and rafting, as long as our guests do not wish some additional adventures and explorations into the vast wilderness at the doorsteps of Taimen Camp Tengis, Chanagai, Ur and Selenge. Clients and guests like to return to our lodges and to repeat the thrilling experience of Taimen fishing year after year. Some of our fishing buddies are going out for big Taimen with us the 9th season already. As a consequence, every fishing invader must be treated as a poacher on our leased taimen rivers and our fishing guides and the mounted frontier-guards of the government are taking away their fishing-tackle without excuses, if non-local fishermen are not asking for permission at our lodges in the first place. Cormorants became abundant in the recent years on our remote wilderness rivers, migrating in large flocks of 30 to 40 birds from other waters, which suffered some damage on their fish population already. Not only do cormorants use the same food-source as the great Taimen-Huchen, but they are instinctively treating this largest predator as their competitor and rival in the water. Unable to push him away in the deep pool, they are aggressively attacking and wounding mature Taimen with their sharp hooks. Although these wounds may not be mortal in the first place, but can weaken the fish and make him vulnerable for infections and parasites. Unlike in Europe, the Great Black Cormorant is not protected entirely, but enjoys a hunting season like any other game bird. These invasive flocks of cormorants became bold and fearless even towards humans and seem to be over-populated, since they have entered the plentiful, fish-rich Mongolian Rivers and Lakes. Our armed guides, local native hunters and frontier guards are rewarded with a prize per head for every bird they bring, and we are supplying them with free ammunition for their guns. These clever birds, feeding mainly on grayling, are moving away to other shores as soon as they realize, that the lines of their comrades are getting thinner. Our list of clients and guests at the lodge "Tengis" is a long and proud one. 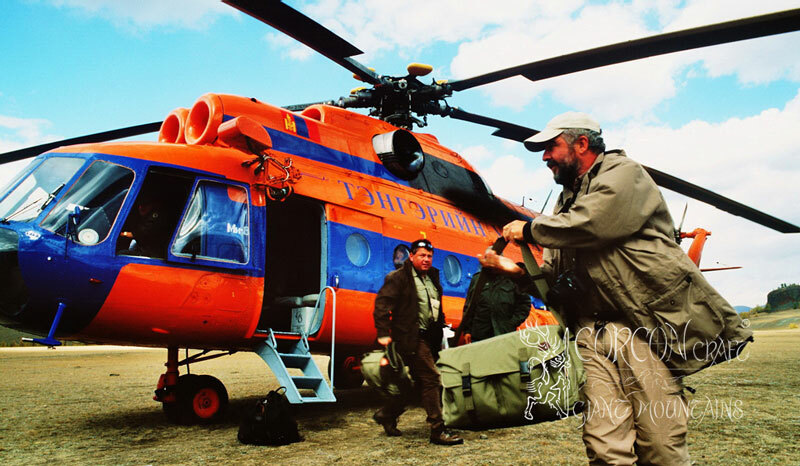 While during the early years we were building our reputation mainly with clients and prime fishermen from the Czech Republic, among them some famous TV-actors and celebrities, we are also working with a well-known professional angler, author and wildlife-photographer from Germany, who returns to another Mongolian river every year and is holding many big fish records. Also a few well-known English fly-fishermen were taking their first Taimen in Mongolia by the use of their double-handers at camp Tengis. The Mongolian Prime Minister and his close elite party were guests at our lodge for a few days, as well as the managing director of the greatest Japanese manufacturer of fishing tackle, who stayed for a full vacation of successful Taimen fishing, arriving at camp by charter of the government helicopter from the Mongolian President..... - But also very common and modest, fine fishermen from Australia, New Zealand, Russia and Spain have been landing their first record-class Taimen with us. They call for us, whenever there is a serious fisherman, who wants to move further and feels ready to take the biggest trout in the world. Over the years, with some ups and downs and learning from the growing pressure on many rivers even in such a vast country, we have managed to establish a full dozen of our own firm log-cabin lodges and yurta / ger camps at the major river-systems in the Frontier of the North. 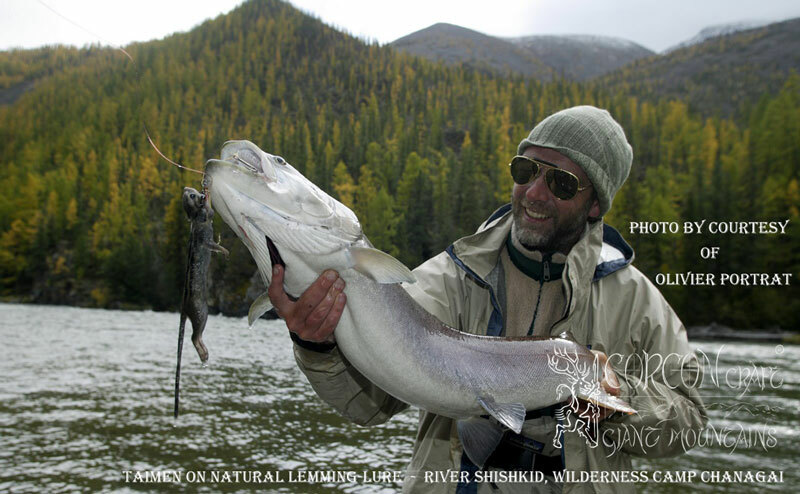 With a passion for the land and the tremendous fishing, we have invested our efforts into long-term leased river stretches and a sustainable Taimen population management at the Ur, Selenge, Shishkid and Chalchyn basins, to name just a few of the most legendary. As long as there will not be build any roads and easy public access into this vast wilderness area, we feel that the traditional harmony between mother nature and the local nomads, herders, hunters and fishermen will endure. The philosophy of our Green Eco-Tourism and small tours devoted to selected parties of fine sportsmen, honors the stillness of this precious land in a pronounced non-offensive and protective way. A recent scientific survey, ordered by the Mongolian Government throughout the northern provinces, revealed, that the river Shishkid and his remote tributary rivers, must be marked as one of the very best habitat for Giant Taimen and as their last refuge and stronghold for years to come !